Obama presented his speech from the White House Rose Garden Friday morning following the release of the divided 5-4 ruling, touting the achievements that he has made surrounding his longstanding homosexual advocacy. “My administration has been guided by [equality]. It’s why we stopped defending the so-called Defense of Marriage Act and why we were pleased when the court finally struck down the central provision of that discriminatory law. It’s why we ended, ‘Don’t Ask, Don’t Tell,’” he said. “There is so much more work to be done to extend the full promise of America to every American. But today, we can say in no uncertain terms that we’ve made our union a little more perfect,” he stated. Obama then traveled to South Carolina, where he was invited to deliver the eulogy for slain pastor and Democratic pro-choice Senator Clementa Pinckney, who was among nine churchgoers killed by an alleged white supremacist last Wednesday during a Bible study at Emanuel African Methodist Episcopal Church in Charleston. 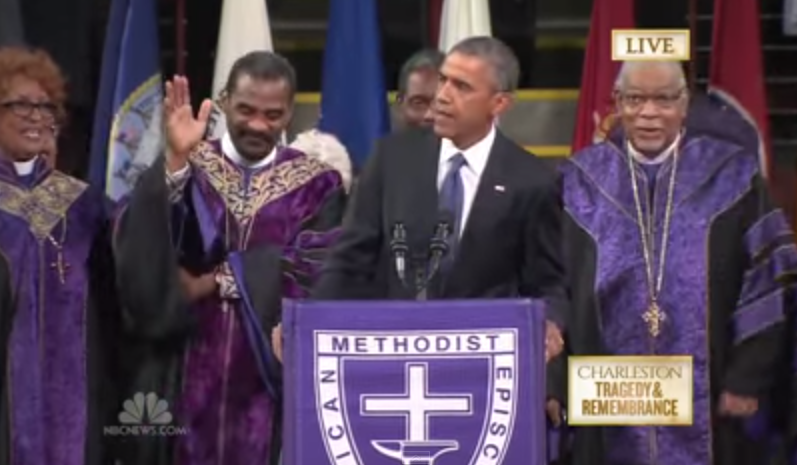 In addition to speaking about Pinckney’s work and upbringing, Obama themed the remainder of his 37-minute speech on the grace of God toward sinners. At the conclusion of his eulogy, Obama spontaneously began to sing the hymn “Amazing Grace,” evoking applause as those in the room stood to their feet and raised their hands to praise the Lord. “May God continue to shed His grace on the United States of America,” he said.